This is my first Handmade Halloween! My daughter didn’t give me much of a choice because she requested a Stay Puft Marshmallow Man costume. Ghostbuster related costumes haven’t been available in stores since the ’80s . . . therefore I had no other option besides handmade. 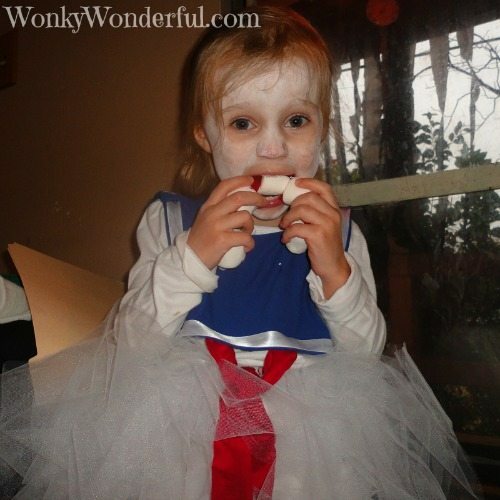 I decided to go for a Stay Puft Marshmallow Girl costume, so I gussied it up a bit. I don’t post many personal photos that aren’t a tutorial or recipe, but the kiddos had such a fun Halloween I decided to share. I knew I needed to post this tonight because apparently in blog land the day after Halloween is the official start of everything Christmas! Yikes, I guess I should really begin thinking about Christmas projects. Here is my Birdie just noticing that her Marshmallow Girl jewelry is made of candy. I am shocked that this necklace was still intact when we returned from trick-or-treating! Here we go . . . Time to get some candy. Recognize that Pumpkin Trick Or Treat Bag? Yep, you can get the free crochet pattern Here. We didn’t trick-or-treat alone, M&M came along too. 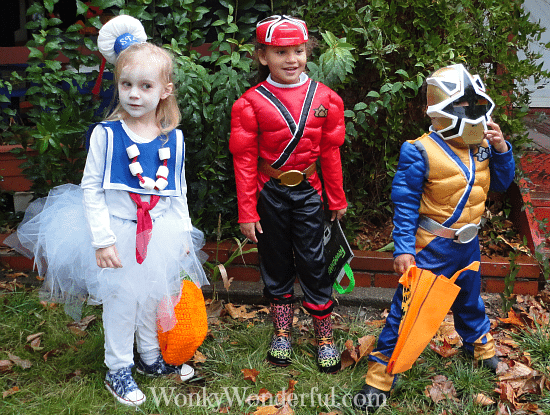 My niece and nephew were dressed as Power Ranger Samurai. Check out those muscles – HiYa! She couldn’t contain herself any longer. The moment we returned from trick-or-treating Birdie started chowing down on her marshmallow and red vine necklace.And of course you need some special Halloween treats waiting for the kiddos when they get back from trick-or-treating. I made dried apricots dipped in white and dark chocolate with orange sugar sprinkles. 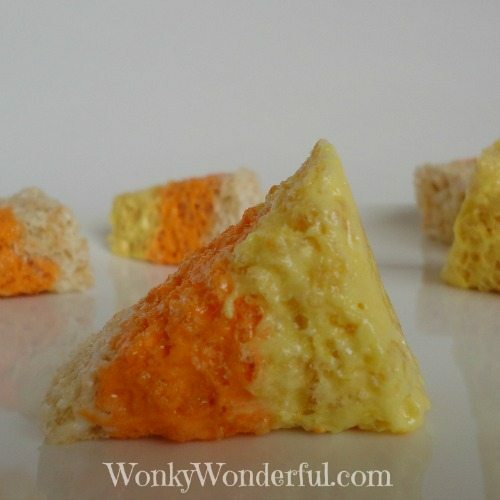 And, super fun Candy Corn Rice Krispies Treats. I hope you and your little ones had an Awesomely Spooky Halloween too! 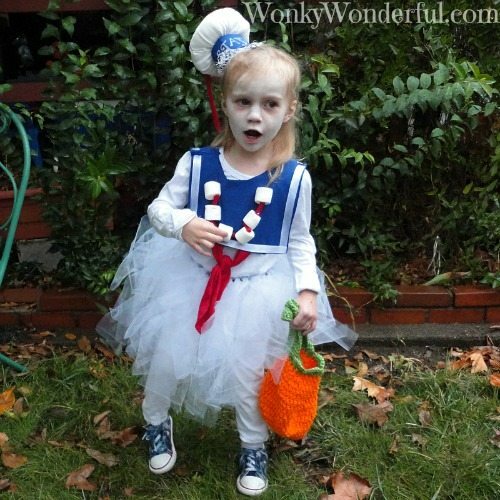 Thanks for taking a peek at Halloween at my house.Join my Wonky Wonderful World!